Teresa Earnhardt will remain owner and CEO of the company started by her husband. The company founded by seven-time NASCAR Winston Cup champion Dale Earnhardt and his wife Teresa announced on Thursday its plans, aimed at long-term development of the company and its three NASCAR Winston Cup teams. The definition of the companys structure comes after three months of outside speculation regarding the organizational future of one of NASCAR racings most competitive operations. The structure is part of a long-term plan to develop the company well into the 21st century. Teresa Earnhardt, owner and CEO of Dale Earnhardt, Inc., has named Doug Swanson to continue as Chief Operating Officer, Ty Norris as Executive Vice President of Motorsports, Steve Hmiel as Director of Motorsports, Joe Hedrick as Vice President of Licensing and Judy Queen as Director-Office of the CEO. Dale and I had a plan for the long term growth of this company years ago," Teresa Earnhardt said. "As DEI moves ahead, were placing people in their respective roles to meet the goals that we envisioned. Swanson, 60, brings over 35 years of business management to Dale Earnhardt, Inc. A former partner of a Big Five CPA firm, Swanson, a native of Greensboro, N.C., has owned his own business and served as an officer with several other corporations before joining DEI in August of 2000. All racing-related issues at Dale Earnhardt, Inc. are the direct responsibility of the 35-year-old Norris, both at the track and at the companys 200,000 square-foot Mooresville, N.C., complex. The Sumter, S.C., native has been an integral part of the operation since 1996, when DEI claimed its first championship in the NASCAR Craftsman Truck Series. Since that time, DEI teams have claimed an additional truck series crown (1998), two NASCAR Busch Grand National Series titles (1998-1999) and six Winston Cup victories, including the 2000 Winston and the 2001 Daytona 500. Hmiels role as Technical Director will be merged with his new position, creating the title of Director of Motorsports and Technical Development. The 47-year-old, Albany, N.Y., native has been instrumental in guiding DEIs wind tunnel and chassis development programs and he will continue to do so, along with numerous other management responsibilities. In addition to overseeing daily operations at the shop, Hmiel will manage the operation of all three of DEIs NASCAR Winston Cup teams trackside. Hedricks role includes the licensing of the Dale Earnhardt, Inc. brand and the Dale Earnhardt name and likeness, as well as performing similar duties for the three DEI teams and Kerry Earnhardt. Hedrick joined DEI in mid-2000 after a five-year stint at Sports Image, a company Earnhardt owned prior to selling it to Action Performance, Inc. Hedrick, a Lenoir, N.C., native, will be responsible for maintaining the quality and availability of all Dale Earnhardt and DEI-related apparel and collectables. 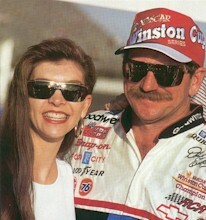 Queen, a Dale Earnhardt, Inc. employee since 1998, served as the Earnhardts personal assistant since joining the firm. Among her duties are the networking of information relating to the CEO. In addition, Queen serves as office manager, overseeing administrative personnel.